The hardscaping around your home is a valuable investment. 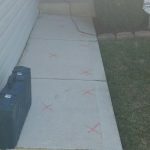 Whether it’s a concrete walkway, patio, or even driveway, you want it to function as intended. 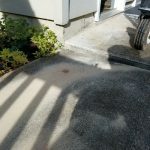 But if any of your exterior concrete is starting to sink and become uneven it can begin to crack or create a dangerous tripping hazard. The more it sinks—the bigger the problem will become. That means, the sooner you deal with it, the better. Of course, you may be wondering if that means tearing up your concrete. 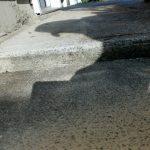 Not only does it sound costly to have the concrete torn out and replaced, but it sounds like a hassle. 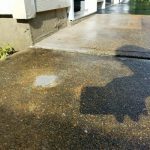 Even for a professional, concrete removal can be laborious and time-consuming—not to mention loud and invasive. Fortunately, there’s a better solution. 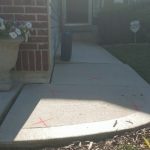 Also known as “concrete leveling”—is a service that takes existing concrete, which has become uneven with the slabs around it, and raises it up. It’s a cost-effective (and less stressful) solution to jackhammering the concrete out and replacing it entirely. Check out our blog about mudjacking here. It’s simple, really. Concrete mudjacking works by drilling holes into the concrete, which are injected with a special limestone/portland concrete mixture with a high-pressure pump. This forces the concrete up out of the ground where it has settled and makes it level with the surrounding slabs. The process also fills in the empty space while re-pressurizing the soil. 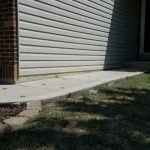 If you have existing concrete on your property that is sinking, then mudjacking may be the best solution for you. It will help you maintain the investment that you have in your property’s hardscaping and allow it to continue to function as it should. If you’re wondering whether mudjacking might work on your property, we invite you to reach out for a free estimate.